Ever the romantic, I bought my beloved a clump of dying plant tissue to put in a vase on the kitchen window. Of course I didn't put it quite like that when I brought them home but it's good to remember what you are buying when you pick up a bunch of flowers. From the moment they are cut to the time when they end up in your wheelie bin, it's a battle against the inevitable to keep cut flowers alive and Spanish scientists have now shown that sugar and the plant hormones in the flowers themselves are key to keeping them looking their best long enough for your partner to forgive you for whatever you've done to offend. A flower is a thing of beauty to be enjoyed but from a biological point of view it has a definitive job to do. The huge diversity in flower anatomy, colour and scent is largely related to pollination. Plants have evolved flowers to attract insects, birds and other animals to disperse pollen and fertilise the female reproductive organs. From the colossal flowers of Rafflesia arnoldii – the largest flowers in the world at up to a metre in diameter, to the minute blooms of Wolffia species – the smallest in the world, the simple goal is the same. Once fertilisation has occurred, the plant has no need for such gaudy displays and the petals are usually the first parts of the flower to show signs of decay once their job is done. To counteract the short vase-life of flowers, a packet of 'flower food' is often included when you visit the florist. These products usually contain some sugar to act as an energy source; a compound to alter the acidity of the water to make it more suitable for the flowers; and a disinfectant to kill off any bacteria which could speed up decay in the vase. 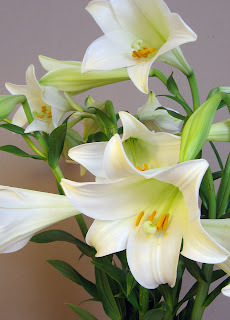 Now researchers using lilies (Lilium longiflorum) have shown that adding sugar to the vase speeds up the opening of the flower and slows down its decay but doesn't affect the rate at which the petals drop off the flower - a sure sign your peace offering should have been binned already. The overall effect of these changes is a longer flowering window and a happy customer. Laia Arrom and Sergi Munné-Bosch found that adding sucrose to the vase accelerated flower opening by 2.4 days and delayed its decay by 24 hours. 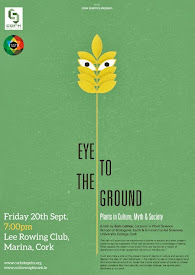 Their work was published in the journal Plant Science earlier this year. Further analysis of how the tissues of the flower use this sucrose showed that the petals and the male parts of the flower took up lots of the sugar and used it quickly. The female parts of the flower, on the other hand, took up sucrose and held on to it - a reserve, perhaps, for the female element's new role as a seed-bearer. So, how did adding simple sugar to the distilled water in the vase increase the length of time the flowers kept their condition? Crucially, the addition of sucrose to the vase seemed to alter the balance of hormones in the flower tissues. Hormones serve much the same function in plants as they do in animals - acting as chemical signals which can be transmitted over long distances. 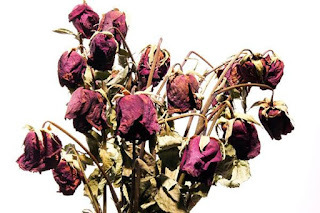 It was already known that a particular group of plant hormones called cytokinins can delay the onset of floral decay and, sure enough, this recent study showed that a cytokinin called zeatin riboside was accumulated in the flowers, prolonging their vase-life. Another plant hormone, abscicic acid, is known to speed-up the decay of petals and the researchers found that flowers treated with sucrose had 57% less absicsic acid compared to control flowers. The cut flower industry is big business. A recent report (pdf) on the industry described it as being worth over US$100 billion a year worldwide. 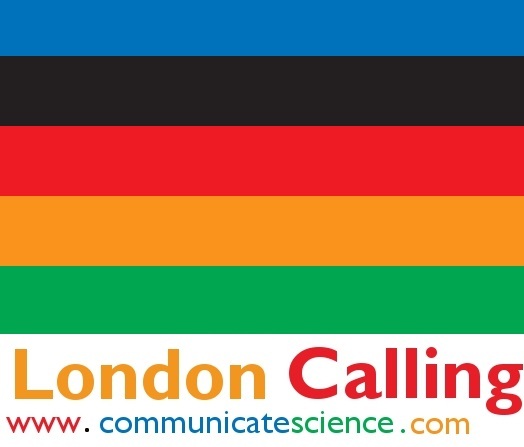 The UK share alone is worth around £2.2 billion - a 250% increase over the last twenty years. That's a lot of husbands doing a lot of apologising. Whatever we're buying them for, consumers like flowers that stay alive long enough to enjoy them. This latest research suggests we're doing the right thing by adding sugar. The extra energy source is able to alter the balance of plant hormones enough to get an extra few days of enjoyment out of the blooms. If that doesn’t work, you may need to try a box of chocolates. 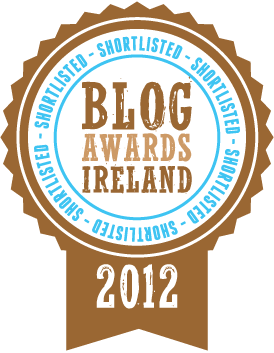 I'm delighted to say that Communicate Science has appeared on the long-list of blogs nominated been shortlisted for an Irish Blog Award. 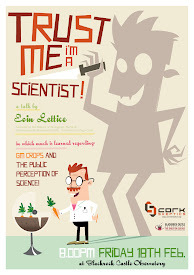 The shortlist can be viewed here. The blog was nominated in the Best Science/Education category alongside a host of other top Irish science blogs including: Science Calling, Scibernia, Deirdre Kelleghan and The Frog Blog. 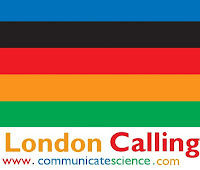 The award ceremony will take place on 13th October. Thanks to everybody who reads, shares and reacts to the blog, I couldn't (and wouldn't want to) do it without you! 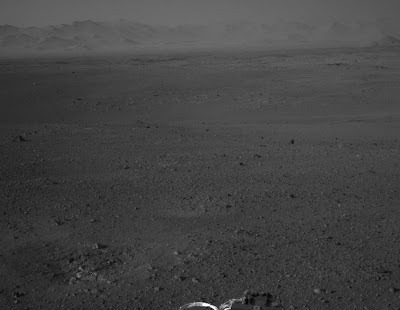 Here's an astonishing image from the Curiosity rover of the eerie Martian Landscape that it has landed in. 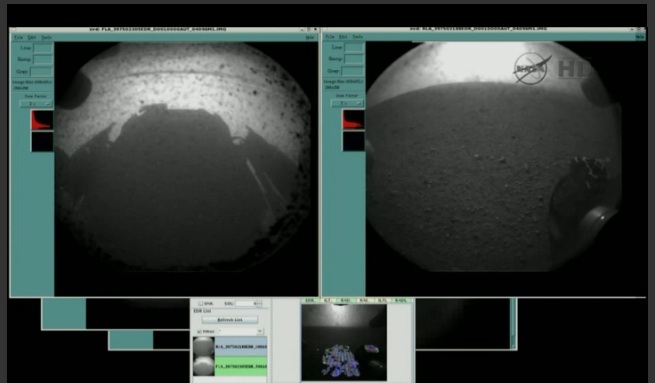 The image was taken using one of the rover's navigation cameras (Navcam Left) on 'sol 2' of the mission. A 'sol' is a martian day - about 24 hours and 40 minutes long. 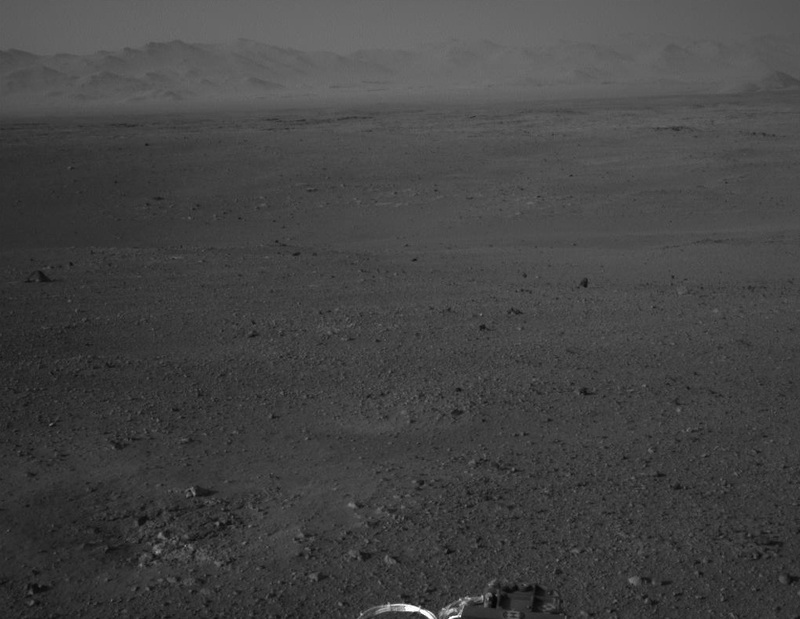 The landscape you can see in the image is that of NASA's chosen landing site for Curiosity, Gale Crater. It's 96 miles in diameter and has a 'layered' mountain rising about 3 miles from the crater floor (see image below). 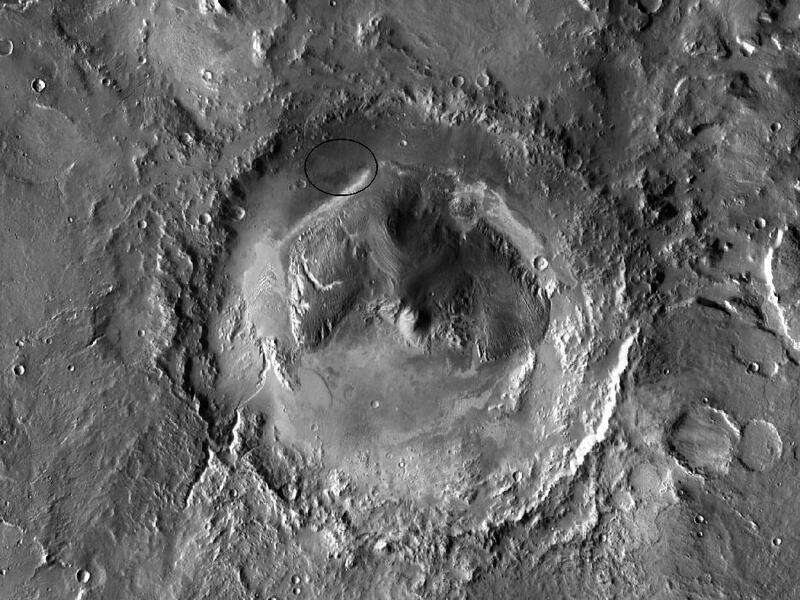 This means that the rover will be able to assess the geology of Mars through analysing the layers forming the mountain. The part of Gale Crater that Curiosity has landed in has shown (from satellite imagery) to be a location where water would have settled. This is key to Curiosity's task of determining whether microbial life is part of Mars' history. The Nasa rover Curiosity has successfully landed on Mars after what appeared to be a textbook landing on the red planet. The first images have been beamed back from the planet showing grainy thumbnail images of the Martian landscape and the wheel of Curiosity. The images will increase in quality and quantity over the next hours and days. President Obama's science and technology advisor John Holdren has described it as "a great day". Read the background to the mission and landing here. 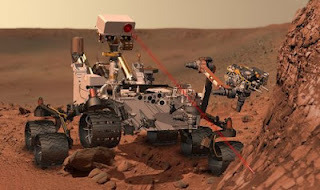 At 6:31 am GMT on Monday, man will return to Mars in the form of Nasa's Curiosity Rover. The car-sized rover has been designed to assess whether Mars ever had an environment which was able to support microscopic lifeforms. Once landed, the culmination of a 36-week flight from Earth, the rover will use its onboard kit to gather information about the geology, atmosphere, environmental conditions and potential 'biosignatures' on Mars. Carrying three cameras, four spectrometers, two radiation detectors, an environmental sensor and an atmospheric sensor, Nasa say the mission will also be a step towards human exploration of the red planet. However, one of the most impressive feats may be Nasa's capability to land Curiosity on the planet without damaging any of the expensive kit on board. Nasa say the mission will serve as "an entrée" to a further decade of Mars exploration because it will: "demonstrate the ability to land a very large, heavy rover to the surface of Mars; demonstrate the ability to land more precisely in a 20 km landing circle; and demonstrate long-range mobility on the surface of the red planet (5-20 km) for the collection of more diverse samples and studies". The landing itself will be accomplished via a "soft-landing" technique employed for the first time on Mars. Instead of using the air bags typically used for such landings, the heavier Curiosity will use a sky-crane to deposit the rover on the surface of Mars. After a parachute slows the vehicle to nearly zero velocity, the rover will be released from the sky-crane and lowered to the ground via an "umbilical cord". 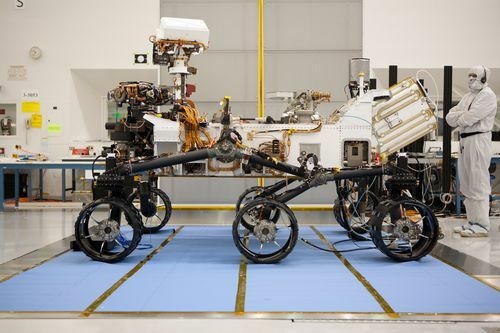 As it is lowered, the mobility system will be deployed so that as soon as it hits the ground, Curiosity will be ready to roll. When the on-board computer recognises that touchdown has been successful, it will cut the umbilical cord and the sky-crane will "power away at full throttle" to crash land some distance away. You can see how this landing will work in Nasa's 7 minutes of Terror video. In a Nasa statement, issued hours before touchdown the Mars Science Laboratory (MSL ) team said that the spacecraft was "healthy and right on course for a landing in several hours that will be one of the most difficult feats of robotic exploration ever attempted". "Excitement is building while the team is diligently monitoring the spacecraft," said Mission Manager Brian Portock of Nasa's Jet Propulsion Laboratory. "It's natural to get anxious before a big event, but we believe we are very well prepared." You'll be able to watch coverage of the landing live on Nasa TV. 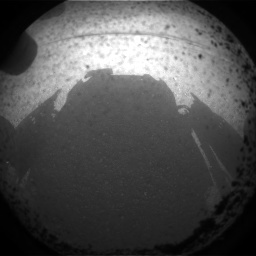 Follow the action on twitter by following the @MarsCuriosity. Well, who would have thought Olympic Badminton would get so interesting? If you're reading this in Ireland, you'll recall the short-lived 'controversy' over the religion of badminton and today we've seen eight female players disqualified over match-fixing scandal. We really should have taken our eyes off the action in the pool and on the beach volleyball arena and kept an eye on the court. Any badminton I've played myself has been the back-garden or windy-beach variety so I've had the distinct handicap of playing with sub-standard, plastic shuttlecocks (that's the odd device that the players are knocking back and forth). Not good enough to coax out the limited skills even I possess. Perhaps I should have been using the top-of-the-line variety? 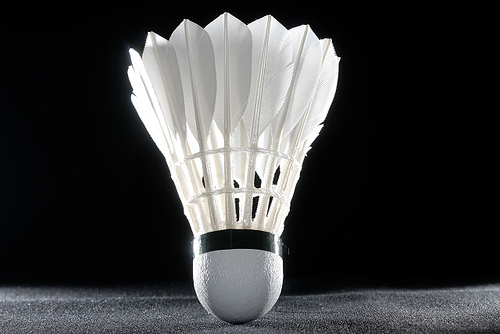 The Olympic shuttlecocks are made from 16 goose feathers. Middle of the road shuttlecocks will try and get away with using duck feathers but they generally dry out and crack much more quickly. According to the laws of the game, controlled by the Badminton World Federation (BWF), the shuttle can be of natural and/or synthetic materials as long as their "flight characteristics generally shall be similar to those produced by a natural feathered shuttle with a cork base covered by a thin layer of leather". Amongst the guidelines are that the feathers should be of uniform length (62-70 mm) and that the device should weigh between 4.74-5.50 grams. A comparitive study of synthetic versus natural (pdf) shuttlecocks has shown that the natural shuttle had a lower drag coefficient at low speeds compared to a higher drag coefficient at high speed. The synthetic shuttle showed the opposite trend - lower drag at higher speed. The laws of the game even allow you to test a shuttlecock for speed, in order to ensure that you're dealing with the real thing - slight imperfections in either direction can have significant effects on the flight and behaviour of the shuttlecock in the air. To test a shuttlecock, one should use "a full underhand stroke which makes contact with the shuttle over the back boundary line". If the shuttle lands between 530 and 990 mm short of the other back boundary line, you can rest easy. However, a recent study of the trajectory of a shuttlecock in badminton (pdf) has suggested that a more scientific approach can be used to measure shuttlecock speed and that this could be used to "replace the traditional subjective method of the Badminton World Federation based on players’ striking shuttlecocks, as well as applying research findings to improve professional knowledge of badminton player training". The authors of the study found that the "special structure" of the shuttlecock makes its trajectory "perform unsymmetrical motion when playing". Due to its large surface area, shuttlecocks fall more slowly than expected due to increased drag. Despite this, they showed that the air force drag on the shuttle was proportional to the square of the shuttlecock velocity. This seems to fit in perfectly with what we would expect - the harder you hit the shuttle, the more opposite drag the shuttle experiences.